The 2014 Lexus RX350 might not be the freshest small luxury SUV sold in America but with a plush cabin filled with modern high tech goodies and the same exterior design language that is featured across the entire brand lineup – the RX350 is still one of the best small luxury SUVs available in the American market. 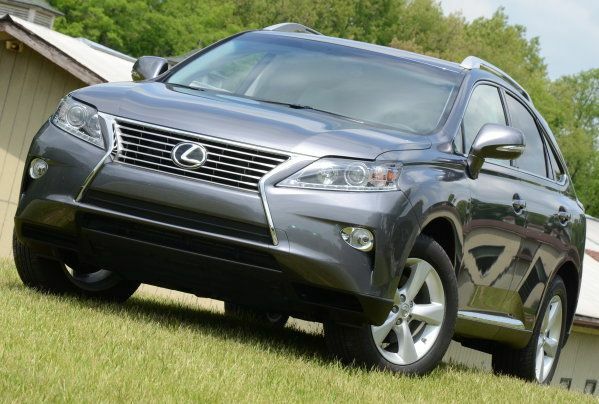 As luxury vehicles go, the 2014 Lexus RX350 is getting a little old. This generation of the RX was introduced for the 2010 model year but an exterior refresh for 2012 has allowed the RX350 to stay fresh in a rapidly growing segment that brings versatility and premium luxury to the masses with a long list of options that includes names like BMW, Mercedes Benz, Acura and Cadillac. That refresh – combined with Lexus’ non-stop efforts to be the top dog in the luxury segment in terms of interior amenities – makes the RX350 one of the best options in a jam packed segment. My test subject for this review was a 2014 Lexus RX350 All Wheel Drive model which carries a base MSRP of $41,160. Options included the Comfort Package ($1,340), the Mark Levinson 15 speaker Sound System ($995), the elaborate Lexus Navigation package that includes the Lexus Enform App system ($2,775) and the Premium Package that adds all sorts of high end goodies inside and out ($2,760). When you factor in the $910 destination fee, my RX350 test vehicle had an MSRP of $49,940 and there really aren’t many items that you can ask for in the new RX that wasn’t included in my test vehicle. “Nicely equipped” is an understatement. The Lexus RX350 benefits from a 2012 refresh that introduced the spindle grille design language that has slowly spread across the entire brand lineup – and I view that as being a very good thing. The distinct shift among every luxury segment towards a sportier, more aggressive feel has produced a perfect automotive climate for the spindle grille Lexus design and this look is every as attractive on the RX350 as it is the rest of the brand’s lineup. The sporty styling isn’t quite as aggressive as it is through the other modern Lexus models but it is extensive enough that the RX350 fits with the brand’s lineup and stands out in the competitive segment. The key feature of the 2014 Lexus RX350 is the front end sporting the brand’s familiar spindle grille design with chrome bars running through the middle and a thick chrome trim piece angling down each side making it very clear that this is a luxury model. On each side of the spindle grille, the RX350 has a set of projection HID headlights underlined by a row of LEDs that bolster the sporty looking while the high tech aspect of these headlights helps the accentuate the luxury feel of this crossover. The fog lights sit low in the aggressive front fascia, set into a sharply angled cooling vent. The low, flat front end combines with the aggressive front fascia to give the RX350 a low, sporty stance that I really like. Too many small SUVs have an awkward, upright posture that makes them look clumsy, but the RX350 is not on that list. Along the sides, the 2014 Lexus RX350 AWD has a very sleek profile with the flat hood, the steeply sloped windshield, the long roofline and the angled black glass giving the RX a slippery form and superb aerodynamics, punctuated by the subtle rear spoiler that extends straight off of the rear roofline. The 18 inch 5-spoke rims are sporty, but they still help bolster the luxury attitude of this SUV with help from a touch of chrome around the windows and along the lower body lines. This side view also shows that the RX350 AWD has a slightly taller ride height than some of the competition so this Lexus can deal with rougher terrain than some of the competition – although I don’t expect many RX350 owners to be tearing up the dunes with their compact luxury SUV. On the other hand, the tallish ride height will allow owners to clear deep snow without any concern of getting bogged down and stuck. Out back, the Lexus RX350 is a touch milder in the design language, but the clear taillights with red inserts and lots of chrome cladding allows this rear section to fit int the Lexus lineup nicely. I love the look of the current Lexus design language and while I would like to see a touch more aggressive styling on the RX350, the spindle grille format that is featured on almost every modern Lexus vehicle is well represented on this roomy little SUV. It has the sporty roots that we see in the entire Lexus lineup, but there is enough chrome and enough exterior technology (like the HID headlights) to make it very clear that this is a luxury crossover. It could be a little meaner – but the RX350 has a pretty face that allows it to stand out in the popular segment. As soon as you open the door and climb into the 2014 Lexus RX350 AWD, it is crystal clear that this is a premium luxury vehicle. Im a sucker for a luxury car with sharply contrasting interior shades so it should come as no surprise that I adore the light grey and black interior spread that was included with my test vehicle. The very light grey leather on the front and rear seats, the center console armrest and the door panel armrests combine with the light colored carpeting and headrest to brighten up the cabin against the dark black trim found on everything else – from the door panels to the dash board. The front seats have full power controls along with a plush leather seating surface that is both heated and cooled. The rear seats aren’t heated or cooled but they do offer the ability to move forwards or back as well as reclining so these seats offer more comfort than the rear seating positions for most SUVs. The front seats offer a ton of space in every direction for the driver and passenger and while the leg space is a little tight for the rear seating spots, there is more space than is offered by some of the competitors and in the long run – there is enough room for a 6’2” person to sit comfortably. I don’t know that I would plan a cross country trip with a bunch of pro basketball players, but a family of four – even with two very tall kids – should find this to be a very comfortable daily driver. In fact, the middle seat is wide enough that a family of five will be able to get all three kids around without TOO much elbow wrestling in the back seat. There is also a huge rear cargo area that is accessible with a very large door opening so you can make good use of every inch of the available cargo space while a removable and retractable tonneau cover allows you to hide away items from view when you arent hauling tall cargo. The 2014 Lexus RX350 doesn’t have every cutting edge (and cost increasing) gadget in the industry today, but there is also very little that you can ask for in terms of interior goodies. A high tech infotainment system with an easily voice controlled navigation program and one of the best interface setups in the industry, super plush, comfortable seats and enough room to very comfortably seat a family of five puts the RX350 at the top of the luxury crossover segment. The 2014 Lexus RX350 is only available with a 3.5L V6 whether it is equipped with front wheel drive, all wheel drive or the slightly sportier F Sport package. This engine sends 270 horsepower and 248lb-ft of torque to all four wheels via a 6-speed automatic transmission and an advanced all wheel drive system. This isn’t the most powerful engine in the segment but it provides enough power to allow the RX350 a solid amount of acceleration from a stop and when cruising at higher speeds – like when you are passing someone on the highway. The RX350 is actually a little less inspiring in terms of acceleration than the rest of the Lexus lineup, but it is a very adequate engine relative to the rest of the segment. The RX350 won’t blow your socks off with a mind blowing 0-60 time but neither will any of the other models in the segment and, more importantly, you also won’t have any troubles keeping up with traffic or quickly accelerating to merge into fast moving traffic. I would like to see a touch more power and a touch better acceleration figures for the future RX lineup, but the current 3.5L V6 provides plenty of punch for the vast majority of small luxury SUV drivers. High performance obviously isnt the first concern for the buyers of small luxury SUVs so this 3.5L V6 is plenty of engine for the RX350. Best of all, with very real fuel economy expectations of 18mpg around town, 20 combined and 24mpg on the highway, the Lexus RX350 is a roomy SUV that won’t beat you up too badly at the gas pump. Those who really demand more power and better fuel economy can opt for the RX450h hybrid with a total output of 295hp, but the RX450h also has the added weight of the hybrid components. The RX450h increases fuel economy measures to 32 in the city, 30 combined and 28 on the highway, but it also adds around $7,000 to the price in AWD trim. For the money, I would deal with the fuel economy figures of the RX350 AWD which will allow you to get better than the expected 24mpg when on long highway trips. The 2014 Lexus RX350 AWD is a compact SUV, but you can barely tell from the ride quality. This crossover offers one of the smoothest rides Ive experienced from a “utility vehicle” and even on rough Detroit highways at higher speeds, you will hear very little wind or road noise. Only the harshest bumps in the road transfer through to the occupants, even when driving on some of the unpaved “natural beauty” roads around the Metro Detroit area. In other words, this luxury SUV offers a true, premium luxury ride with a whisper quiet cabin and a smooth enough ride to prevent waking up the baby. In addition to offering a brilliantly smooth and quiet ride – the RX350 handles quite well both in tight quarters and out on the open road. The RX350 isnt the most powerful SUVs in the segment, but it offers sedan like handling characteristics that make it one of the more pleasant vehicles to drive in this segment. Finally, the advanced all wheel drive system allows the RX350 confident footing in slick paved roads or sloppy, muddy roads. The 2014 Lexus RX350 drives like a luxury sedan while achieving great fuel economy coupled with the surefootedness of all wheel drive – making it one of the most capable year-round luxury crossovers sold in America. The ride is luxurious in every way, but Lexus has managed to design the steering and suspension system of this sporty SUV in a way that affords spiriting handling without hurting ride quality. Whether you are driving across the country or just across town to work every morning – the Lexus RX350 offers an incredible ride. If you want a roomy premium luxury small SUV that will offer a smooth, quiet ride with an extensive collection of luxury amenities – the Lexus RX350 could be your next new vehicle. The available interior options leave nothing to want for and even when loaded to the gills with everything included on my review model – the RX350 all wheel drive prices out under $50,000. The RX350 might not be the freshest vehicle in the Lexus lineup but this classy compact SUV is still one of the best choices in the segment. Before buying a small luxury SUV, the Lexus RX350 is most certainly one of the vehicles that you have to drive before cutting a check as it offers premium luxury, solid fuel economy and a great all season ride. Other vehicles in the segment might have a leg up here and there such as more power or better fuel economy, but the Lexus RX350 does everything very well. It might not be the best in every single category, but it is towards the top in every single category – making it one of the best options in the class. Excellent review and I agree having owned one of these. One thing I will say is that from my point of view the RX is a full size or large crossover. I don't think of it as a small SUV as you put it. I bet the buyers, largely female, don't consider it small in any way. When I had my gs 350 f sport in for 10k service, they let me borrow the 2014 Rex 350. I was so impressed, as was my wife for sure, that I bought her one immediately. This is one perfect car for city and country living in Thailand which happens to be where we live.